The commencement of the grouse shooting season on the Glorious Fourth and the arrival of the Beaujolais Nouveau are without interest for me for me, what I get excited about is the First Batch of Mince Pies baked on 1st December each year by Mr Gellatly, baker and pastry chef at St John. Yesterday, I awoke to an auspicious clear blue sky and my washing, which had been dripping on the line for three whole days, had dried overnight. Skipping breakfast, I opened the first window on the advent calendar (the angels of the Annunciation), grabbed my sheepskin hat and took a stroll over to St John Bread & Wine in Commercial St.
As I approached the bakery counter, I could see the mince pies gleaming with a subtle glazed topping, none of your pallid pale pastry here – the shortcrust of these pies is golden brown. Mr Gellatly, who had probably been awake all night baking them, leaned over with a proud paternal smile as the waiter put two in a bag for me, declaring the arrival of the sacred moment “That’s the first mince pies of the season!” Between the three of us we exchanged a glance of recognition and I think Mr Gellatly would have liked to have said more, but his mince pies spoke eloquently for him because I was out the door and down the street before I knew it. The hunger pangs as a consequence of the lack of breakfast were leading me on and as I turned the corner from Commercial St into Puma Court, I became aware of warmth in my hands, the mince pies in the brown paper bag I was clutching were still hot from the oven. I stopped in my tracks in a powerful moment of realisation. 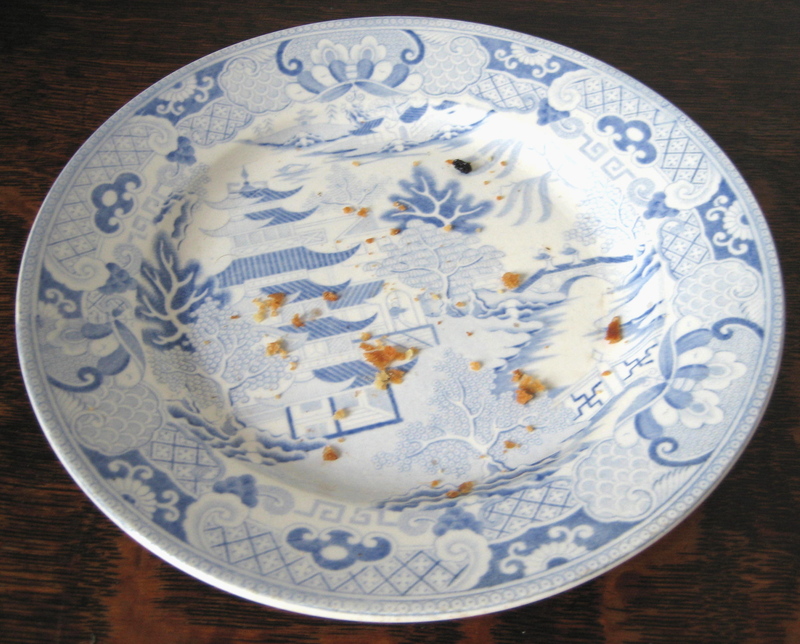 The picture above was supposed to show two mince pies on a plate but unfortunately only one made it to the photoshoot. I am not ashamed to confess that the other was consumed somewhere between Puma Court, Wilkes St and bakery paradise. Standing alone on the pavement in the sparkling winter sunlight among the ancient houses, I bit into the soft nutty pastry of my first mince pie of the season. In a moment, all the Christmases of my life came back to me in a rush as I was transported instantaneously to far away country places and the seasonal celebrations of my relations now long dead, where I am witnessing events as a child. For me, every Christmas contains the emotional import of all the Christmases I have already had in my life, like a set of Chinese boxes. And a mince pie is the key to open up this powerful archive of experience. Back in the vivid present tense of Puma Court, as the pastry melted in my mouth, I savoured buttery shortbread and the crunch of a few grains of sugar topping the insubstantial case but, even as I became aware of these flavours, I was already enjoying the intense fruity mincemeat that was deliciously tangy without being over sweet. The proportions were just right, in his wisdom Mr Gellatly understands that the case is simply a means to end, just enough pastry to hold a generous portion of mincemeat. It is a question of form meeting function. 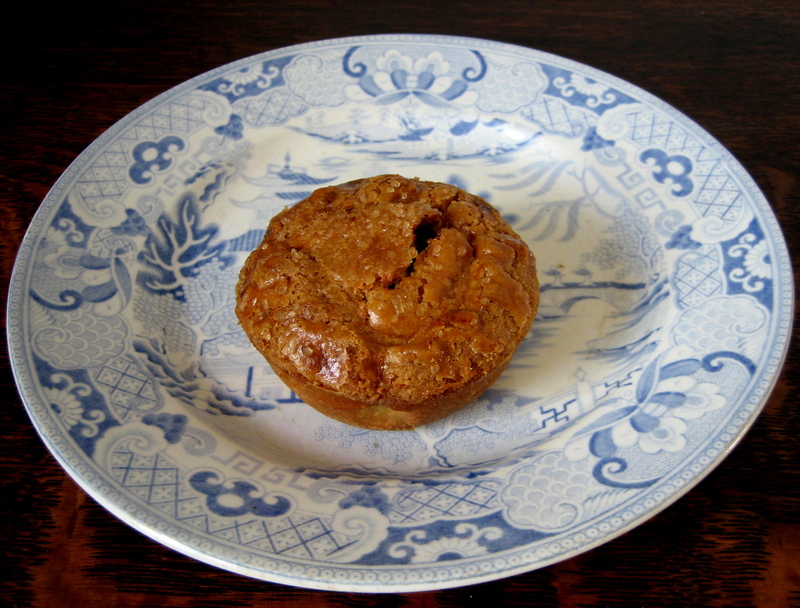 Already, as I write this now, the blue and white plate is bare although I am still enjoying the strong citrus aftertaste of the mincemeat and excited in anticipation of all the mince pies to come this Christmas. Somewhere out there in a factory, Mr Scrooge the baker thinks he can get away with making heavy pastry cases with a tiny spoonful of mincemeat inside and fool people, but that is all humbug now because Mr Gellatly knows that Christmas is about generosity and the wonderful St John mince pies are here! The confection looks fabulous and your description is mouthwatering but it is the plate that I covet! Oh, mince pies! Some people don’t like them. I used to scoff them with a port and brandy drink I was introduced to working in an off-license. Really I used to scoff them, I didn’t hold back. Once a year, of course.